The Nassau Lake Park Improvement Association, Incorporated, is a New York State not-for-profit corporation, incorporated in 1925. The members of the Nassau Lake Park Improvement Association are bound together for the purpose of improving the waters and water life of Nassau Lake, of owning, maintaining, beautifying and keeping the parks of Nassau Lake for the benefit of the membership and to undertake such works as of may be of benefit to the surrounding communties. The Association owns the lake bed, real property on the East, West and South shores of Nassau Lake, including a ballfield and parking lot, other real property, and the dam. 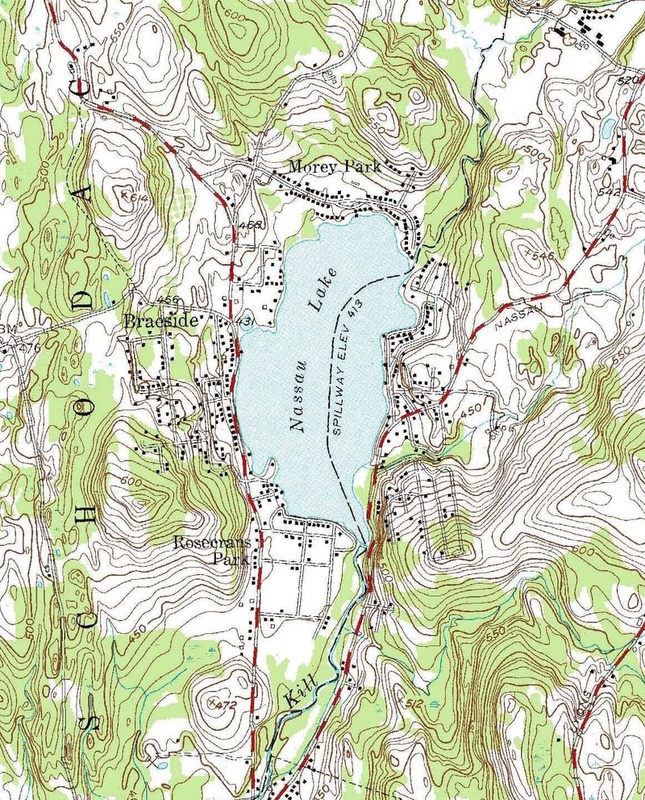 Use of the lake and Association properties are reserved for members of the Association. This includes the lake, lake ice, and real property. See our Membership Information page for details on how to join. See the Town of Nassau's website for more information on the History of the Town of Nassau. Jonathan Hoag, who settled in Nassau in 1792, purchased of Patroon Stephen Van Rensselaer, several hundred acres of land on and adjoining the site of the Village of Nassau. The body of water now known as Nassau Lake was then named Hoag's Pond. It was created by Hoag by constructing a dam which covered "the Vlaie" or "Beaver Meadow" with water. Hoag became perhaps one of the most industrious and progressive of the pioneers of Nassau.